Pin It Here is a different and fun way to season your grilled corn on the cob. I found it at marthastewart.com, tried it and loved it! All you need is a brown bag and your favourite corn toppings. I used chili powder, lime juice (squeezed lime wedges) and salt. 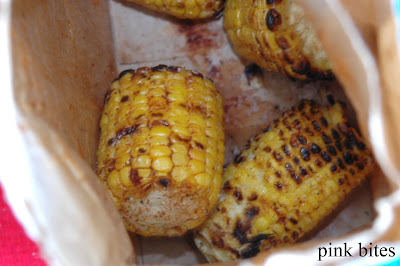 After grilling the corn (I cut them in half to make it easier to shake) place them in a paper bag (I used 2 just in case), top with the chili powder (about 1/4 teaspoon for every 2 corns), squeeze 1 lime inside the bag and add salt to your taste. Shake it all very well. To serve, I just cut open the bad and voila!!! 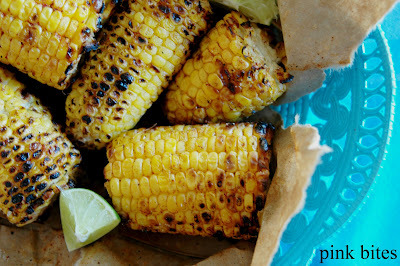 Ooh, such a delicious twist on grilled corn! Whoa. 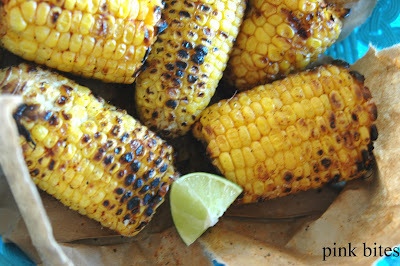 We've been into a lot of grilled corn lately, but I still haven't tried it on the cob with chili and lime. This is a meal all by itself as far as I'm concerned. YUM.